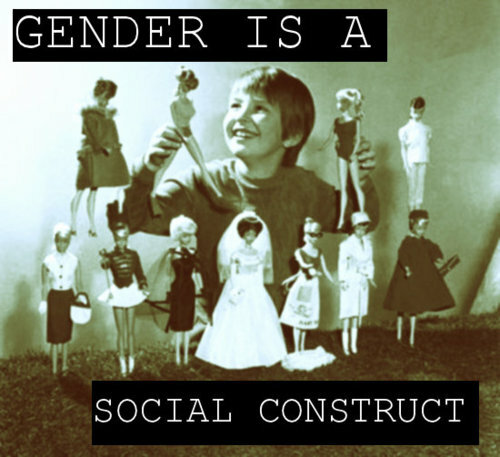 One of the most harmful and also false ideas that liberals have introduced to American culture is the idea that gender is nothing more than a “social construct.” Put another way, there’s no real difference between men and women; we just think there are differences because we accept illogical cultural norms that have been passed down through the years. This is a “the moon is made out of green cheese” grade dumb concept; yet and still this idea undergirds liberal feminism. If a man can do it, then a woman can do it just as well, even if we’re talking about the military, firemen or being a cop. It’s the core concept that allows liberals to try to present transgenderism as a civil rights issue instead of a mental health issue. Undoubtedly, it’s also part of the reason you see so many sad, lost, nearly androgynous young men these days. If being a man doesn’t mean anything, why go through the work of taking on masculine traits? The sleight of hand that liberals use to promote this obviously foolish idea is to point out that different cultures have different definitions of what constitutes manliness. To many Americans, enduring boot camp and becoming a soldier is a great way to prove your masculinity. To become a man in the Sateré-Mawé tribe, a boy must stick his hand in a glove full of venomous ants with incredibly painful bites and hold it there. On the Greek island of Kalymnos, manhood is proven via deep diving without equipment. Those men consider using diving equipment for safety to be effeminate. You could be the epitome of manhood in America without ever allowing yourself to be bitten by venomous ants or a man’s man in the Sateré-Mawé tribe without ever deep diving; so doesn’t that mean gender is a social construct? As Jack Donovan has noted, “Strength, Courage, Mastery, and Honor are the alpha virtues of men all over the world. “ A hard-assed American drill sergeant might think it’s dumb as dirt to stick your hand in a glove full of Bullet Ants, but I can guaran-damn-tee you he has a certain level of manly respect for a guy who’s tough enough to do it. Moreover, there are no cultures anywhere where let’s say someone like Justin Bieber would be considered manly while someone like John Wayne would be considered feminine. Similarly, there are no cultures like the fictitious Amazons where women do the fighting while the men hang back. In the early 1900s, explorer Ernest Shackleton needed volunteers for a South Pole expedition. He placed an advertisement that read like so in the London Times: “Men wanted for hazardous journey, small wages, bitter cold, long months of complete darkness, constant danger, safe return doubtful; honor and recognition in case of success.” The following day, over 5000 men showed up to volunteer. Note that 5000 MEN showed up to volunteer. In no culture in the world would women ever be the majority of people showing up for something like that. Not today, not last year, not at any point in history. Yet, if gender really were merely social construct, we’d expect to see women making up the majority of warriors, hunters and the people doing backbreaking, dangerous jobs SOMEWHERE. Along the same lines, there’s no culture where men do the majority of the child rearing. If gender is really just a random, illogical series of habits that civilizations pick up, then we SHOULD see a lot more overlap, but we don’t – and we never will. Part of this is based on the very real physical differences between men and women. Men are taller, bigger, have more muscle mass. In violent confrontations with men or in tasks that require great strength, very few women can hope to compete with even the average male. This is the same across all cultures and it has helped create different incentives for men and woman. Men have been and still are the ones who do dirty, dangerous and violent work. Men who are good at it are admired by other men and sought out by women. Equivalently, women are admired for their beauty and their feminine wiles. Again, this is something you’ll find across all cultures which again shows you that gender is not a social construct. Instead it’s an outgrowth of biological reality. Well, knowing that I collect these things so that I can write about them for Taki’s, one of my old friends, a former blogger, said, “You’ll like this.” He e-mailed me this link to a Reddit room where everybody is chatting about these really weird people. Now we’ve all heard about a man trapped in a woman’s body and so forth. Well, like I said earlier, there are people who feel the need to just keep pushing this sort of thing because the thrill of that has worn off socially. So there are people who believe that they’re — say, black, disabled women in white male bodies or they believe that they are a planet or they believe that they are an alien. Now I met some of the “I think I’m an alien” people years ago. Hey, wait a second. What bathroom do those people get? Yes, one day you may be threatened with prosecution by some liberal for refusing to refer to a woman who believes she’s a fox by her animal name “Arf Arf.” That’s not a future any of us should want.